The central objective of all St James's church activities, our mission, is spreading a Christian influence in the local and distant communities. St James's Church plays an important role in the community of Hampton Hill. This is done in two different ways. One is by the clergy and lay people going out into the community, ministering to the parishioners and the other is by opening the church to individuals and groups and encouraging people to come into our midst. There are a number of ways that we seek to build up the church’s life in the community. 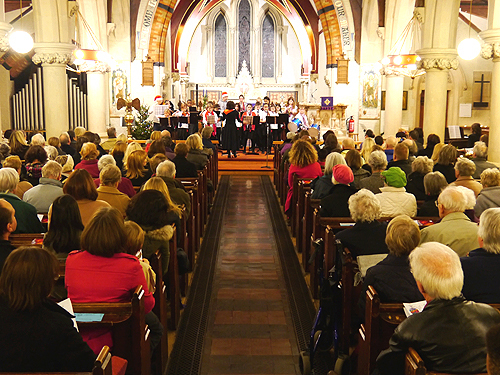 There is always a friendly welcome for the many people, individuals and groups, who come to the church and church hall - to worship, for advice, to arrange or attend a baptism, a wedding or a funeral, to arrange or attend concerts or recitals, or perhaps to join the nursery school sessions, classes or evening meetings. Refreshments after the 09.30 and 11.00 Sunday services are very important in making new people feel welcome and enabling members to talk to one another. The clergy and parish visitors go out into the community, providing a link with the church for anybody who is unable to attend church or is in need of support or company at a particular time, including the housebound, the elderly, the lonely, the bereaved, those who are unwell and anyone else in need. As well as post-funeral support, all bereaved families are invited to an annual All Souls remembrance service. We have an active relationship with the uniformed groups who are always welcomed into the church. We also have an active relationship with the local schools, with clergy often visiting them and sometimes taking assemblies. Groups from the schools visit to learn about the church to help with their Religious Education work. We welcome the local schools for their own special services. We share information between local churches through the Hampton Deanery and activities with all the local churches in the Churches Together around Hampton (CTAH). The clergy take occasional services at places like Teddington Hospital, Marling Court and Laurel Dene, providing for growth in Christian discipleship. 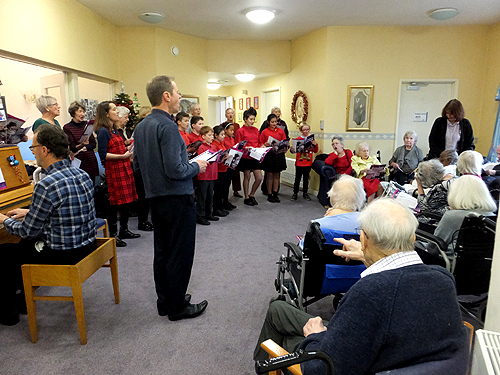 The picture below shows a Carol service at Laurel Dene led by Revd Winterburn and supported by parishioners and Hampton Hill Choristers. We help parishes in poorer parts of London through our Common Fund payment to our diocese and communities near and far by generous giving to charities.